BFF's web pages are available for people to read. We are glad this happens regularly. The real goal, however, is to see people radically changed by God's mighty Word through the mighty power of the Holy Spirit. By scanning through a few topics, we quickly realize that some viewers are very confused and troubled. Some are searching for answers to their desperate needs. Note the two topics below that one person looked for (circled in red). Can you see how desperate this person is? These two searches led them to two different BFF web pages partially shown below. Click on them if you want to go to the actual page. 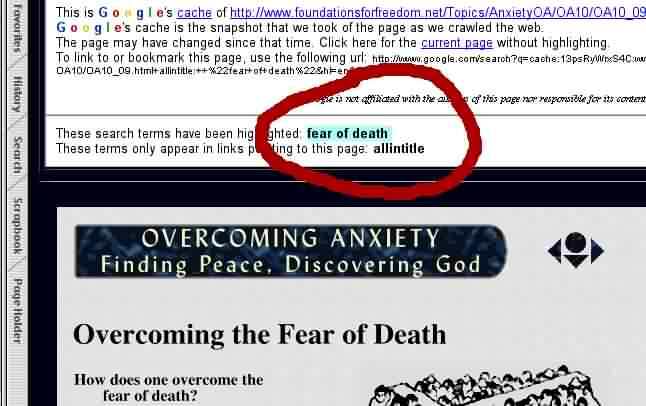 They looked up 'loneliness and suicide and Bible' and then 'fear of death.' You can only guess what problems they face to bring them to so despairing a place in life. Not many are looking up such topics, but this person was. The bulk of BFF's material is focused on ministering to the broken hearted. Please continue to pray with us that God would bring new hope to people through His mighty Word. I recently visited my Aunt but when I went to leave, the van wouldn't start. Someone came to the rescue and got it going by banging on the starter while I turned the ignition. The next day my wife turned the key and I hit the starter so we could get it to the mechanic. God used this incident to prompt me to keep praying for the restoration of His church. He especially encouraged me to pray that God would 'start up' a great and godly work of His Spirit upon the earth. As we travel around, we are constantly made more aware of the many broken - and not repaired - people that fill our churches. This shouldn't be. Praise God for the highest readership yet averaging 425 page views daily! Work on the newest series on "Intimacy with God and man" has started! We are thankful for the progress in preparations Elizabeth has made for her last year of college. Thank God we could get our latest update letter out in good time. We praise God for the special provisions for Elizabeth's education. We are thankful that our van with our 6 young children broke down in our aunt's driveway and that the man was able to get it going. Pray that God's Spirit would genuinely help the broken-hearted and edify each reader. We have by God's grace almost reached our year end goal of 500 page views each day. Keep praying! Elizabeth is returning to finish her last year of college around Labor Day. Pray for special wisdom while writing materials to strengthen marriages. Pray that a passion for God's Word would break out or 'Start up' in Pastor Stephen Paul's ministry in India as well as around the world. Ask God for special wisdom, insight and concentration during the work on bigger projects such as the one on growing intimacy based on the Song of Solomon.